The number of road traffic accidents/deaths has been rising exponentially over the past decade in India, thanks to factors like growing population, surging demand for transport/commercial vehicles, poor traffic rules and regulations, and SPEEDY VEHICLES. In 2013, more than 1.3 lakh people had lost their lives in road traffic accidents! Adding to this unpleasant data is the estimation that by the year 2020, road traffic accidents could become the third most common reason for deaths in the country. In response to this alarming rate of accidents caused by over-speeding vehicles, the Ministry of Road Transport and Highways, Government of India, announced its mandate to enforce installation of speed limiting devices (SLDs) in transport vehicles pan India. SLDs, also known as speed limiters or speed governors, are devices used to control the top speed of vehicles. The device limits the fuel feed, thereby keeping the vehicle’s speed under control. Making speed limiter installation mandatory in transport vehicles such as trucks, school buses, etc. is expected to significantly bring down rates of road traffic accidents. Following the Ministry’s mandate, a Supreme Court Committee on Road Safety has issued installation guidelines that all States/UTs are expected to follow. The Committee noted that SLDs are not being properly fitted in existing vehicles across India. The installations are either faulty or the SLDs are tampered with. To avoid these kinds of issues, the Committee is urging the States/UTs to allow usage of only government approved speed governors. Also, all SLDs have to be type-approved to suit the vehicle models in which they are to be fitted. Autograde is a best-in-class manufacturer of Speed governors that have approval for more than 1000 vehicles models across India. Only sealed SLDs should be used for installation. For each SLD deployed, a Unique Identification Number (UIN) has to be created. The UIN, along with other vehicle details including engine number, chassis number, etc., should be uploaded in the VAHAN DATA. The installed SLD should have the Registration Number of the vehicle engraved on it. This is to avoid reuse of the SLD in any other vehicle. The Committee has directed the States/UTs to withdraw approval certificates from manufacturers who fail to adhere to these installation guidelines. Also, no fitness certificate will be issued for any vehicle if its SLD is found tampered with. The States/UTs are also supposed to present quarterly reports to the Committee detailing about the number of vehicles that apply for fitness certifications and the number of vehicles that do not adhere to the Committee’s guidelines. Will this come into effect immediately? Although the MoRTH’s mandate was announced in January 2017, the enforcement could not be brought into immediate effect as some of the users refused to install speed governors saying that they cause technical issues in the vehicle, while others continued to use non-approved or faulty devices. 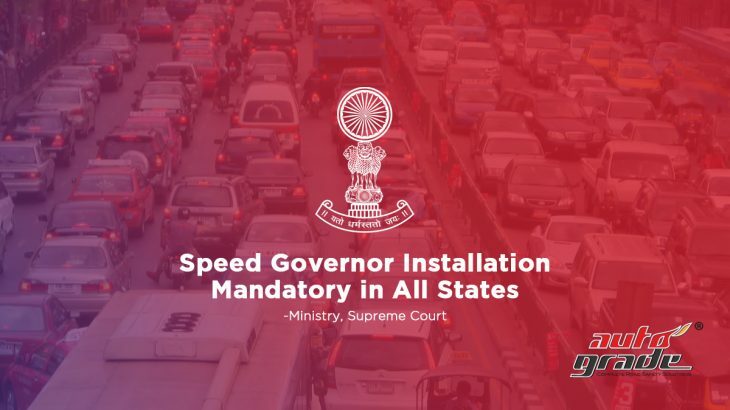 Another set of users claimed that there’s a shortage of speed governors in the market, to which Mohammed Ashraf, MD of speed governor manufacturing company- Autograde, responded stating, “There is no shortage of the devices in the Indian market. We have been manufacturing road safety solutions in India and the Middle East for almost a decade.” According to Mr. Ashraf, who lauds the Government’s and the Court’s initiatives on road safety, the new SLD installation guidelines will greatly help in removing bottlenecks and uprooting hidden scams. It will push all the States/UTs to enforce appropriate SLD installation as early as possible, thereby expediting the process of creating safer roads in India. SPEED- The Prime Cause of Road Traffic Accidents & Deaths!